Wow, how quickly the story changes here in Indiana!! Yesterday….it was ALL about the COLTS and today it’s ALL about the SNOW!! 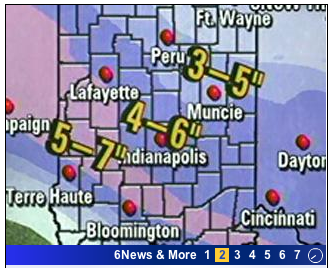 They forecasted 4-6 inches, with snow beginning at Noon!! Well, it started snowing at noon, right on schedule….and it’s basically been a solid white out ever since!! It’s now 2:30 and I have at LEAST 5 inches outside of my house and it’s supposed to snow until MIDNIGHT!!! YIKES!!! They are now saying 8 inches of snow is possible(YA THINK!!!??? ), considering most of the city is at 4-5 inches only two hours into the storm!!! Three of the cities main highways are closed because of all the accidents and just going out for like 15 minutes, I saw many people slipping and sliding and knew this was going to be a rough one!! It’s going to be a CRAZY rush hour, considering there will some crazy amount snow in three more hours….ohhh….wish us luck!!!! Yeah I’m pretty irritated cause it’ll take me at LEAST 2 hours to get to Starbucks tonight and they’re still making me come in. So i’m a little bummed out. it’s like that in springfield too!! it doesn’t seem like it’s going to let up either…i’m OVER this weather, and can’t WAIT till spring!!! We had about the same thing here today! It took me three hours roundtrip to take my hubby to the airport (normally should take 40 minutes round trip!) It was UGLY to say the least!! But I guess it IS pretty!